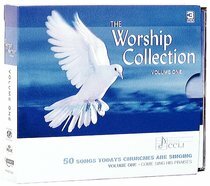 This 3 CD set presents 50 of the most popular songs sung by churches today. A great mix of traditional, contemporary and modern worship classics, including 'Shout To The Lord', 'All I Once Held Dear' and 'How Deep The Father's Love For Us'. About "Come Sing His Praises (3 CD Pack) (#01 in Worship Collection Series)"
The Worship Collection series continues to bring you a refreshing range of Praise & Worship songs at a great price. This latest 3 CD pack is filled with another 50 wonderful songs that will envelope you in an atmosphere of worship. This three CD follow-up to the top selling COME SING HIS PRAISES is amazing value at just $29.95! With modern worship songs, hymns and classics, this is a wonderful resource.